Koh Phi Phi weather in August starts with the best low season conditions but by the 20th-25th starts to be influenced by the September monsoon. August starts hot and relatively dry with many sunny days and light winds. Towards the end of the month the humidity builds, increasing cloud cover and wind and increasing the chance of rain showers. Koh Phi Phi weather in August is not set in stone with set cut off days when the weather changes as it used to in the early 1990s. Nowadays the Koh Phi Phi weather shows pattern rather than precision. In between the two monsoon periods of July and September there is an excellent period of clam stable weather that bring about almost high-season-like conditions. July 10th until August 20th is a great period to visit the island. This period of Koh Phi Phi weather in August is a great time to enjoy water activities and Phi Phi Diving and snorkeling tours are highly popular. Many students, backpackers and travellers from the southern hemisphere (South African, Australian, Brazlian) arrive on the island and the place is in full party mood. During the Koh Phi Phi weather in August the wind allows a lot more tours to make it to Maya Bay. Koh Phi Phi Tours are virtually impossible during the June and September monsoons because of waves at the mouth of the west facing inlet. When the waves are up you can get into Maya Bay from a somewhat precarious walk through from Loh Samah. Many take advantage of the weather to do their PADI Open water Course and the "confined water" beach in front of the Phi Phi Island Cabana Hotel is often full of heads bobbing on the surface taking instruction at this time. Having said all this, the 20 km of reefs are quieter in low season so it is a great time to come and enjoy some extraordinary scenery. 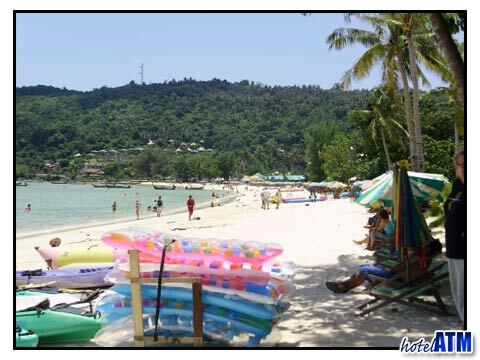 Hotels, guesthouse and hostels are surprisingly busy during Koh Phi Phi weather in August. This is doubly so just after the Koh Phangan Full Moon Party when people arrive on the island in large numbers. Although the island is seen as a place to "chill out", the Phi Phi party scene is surprisingly strong even in low season in places like Slinkies or The Dojo. A lot of travellers just choose to walk in off the ferry and take the accommodation that feels right on the day. The trouble with this is that the best places, the ones with the best reviews and value for money are already booked up by the more savvy, so that it can be frustrating on arrival doing a lot of walking to find the best accommodation. See Phi Phi Accommodation link to find articles on "Backpackers on Phi Phi Island"," Cheapest guesthouse in Ko Phi Phi", "Cheapest Phi Phi Hotel deals in Paradise"," 5 star Phi Phi Island Deals" and more. 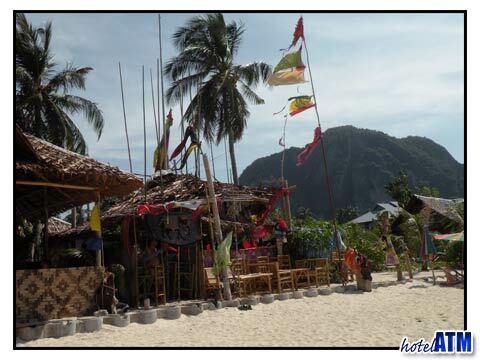 Koh Phi Phi weather in late August brings about a great nightlife scene where people play "dodge the shower". On some nights the rain doesn’t arrive until 8,9 or 10pm, 1, 2, or 3am. When the rain comes down from tall convection clouds it is very strong and can soak you within 10 seconds meaning you are stuck where you are! Some nights you are caught in the bar in the rain storm and nobody leaves and the parties go on and on and on. These party nights are very funny and memorable. When the Koh Phi Phi weather in late August starts to go back to the more humid and wetter monsoonal weather, it's good to know the island doesn’t shut down. If anything it now starts to gear up for high season which starts in November. More dive instructors start to arrive to find work and prepare their schools for the season ahead and the atmosphere is a lot of fun. All in all, Koh Phi Phi in August is a good month to visit.